The trombone sprayer has a sliding brass barrel connected to tube that goes down into a bucket of whatever mix you are using. This sprayer is especially good for foliar feeding with compost tea or Garrett Juice but also effective for applying the organic herbicides. The trombone sprayer is much better than hose end sprayer for several reasons. 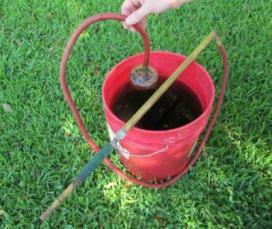 First of all I don't like trusting a cheap plastic device to mix formula for me as the "hose ends" have to do. The perfect mix that you made comes out the trombone sprayer. Second, they tend to stop up. 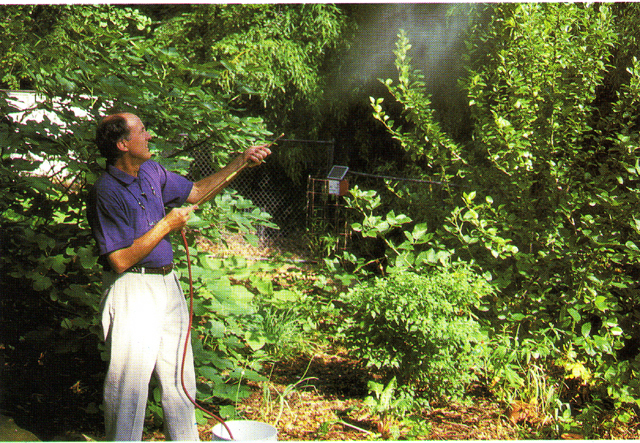 As you are spraying compost tea and look around to see where the dog has gone, the sprayer stops sucking up the material and is only spraying water. That ruins the foliar feeding program. Same thing for pest control. They also tend to fall apart regularly and require a new purchase. Pump-up sprayers are OK because they spray your mix as well, but they are only good for small areas. 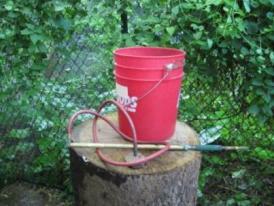 I use a trombone sprayer to do my entire properly in less than an hour - plus it's good exercise. They are also easy to maintain and clean up after use.